Astra Expert Gel Effect n. 34 Peach | Light Your Nails! Oggi vi propongo uno smalto che ha riscosso un enorme successo quando l’ho indossato. Piovevano complimenti! Si tratta del n. 34 della linea Expert Gel Effect di Astra, uno dei sei nuovi colori lanciati per la Primavera 2016. Astra Expert Gel Effect n. 34 Peach* è un meraviglioso color pesca molto acceso e molto lucido, una via di mezzo tra un rosa corallo e un salmone. Si stende con facilità, come gli altri smalti Astra di questa collezione d’altronde, e mantiene la promessa dell’effetto gel, almeno per quanto riguarda la lucentezza. Today I’m showing you a nail polish that got me lots of compliments while I was wearing it. It’s no. 34 from Astra Expert Gel Effect collection, one of the colours that Italian brand Astra released for Spring 2016. Astra Expert Gel Effect n. 34 Peach* is a fabulous peach creme, very bright and very glossy, a mix between a coral pink and a salmon-y orange I would say. It applies easily and evenly, as any other Astra nail polish from this collection to be honest. It also delivers that gel glossiness it promises. Ma non è stupendo per la Primavera-Estate? Tra l’altro non credo di avere niente di simile nella mia collezione, gli smalti che più gli somigliano sono più corallo o più salmone, non hanno questo bel mix. Mi piace proprio tanto insomma, e ve lo consiglio vivamente se avete occasione di trovarlo. Vale senza dubbio il suo prezzo (tra i 3€ e i 4€ a seconda dei rivenditori) ed è un acquisto di cui non vi pentirete. Sarò un po’ ripetitiva, ma Astra con questa linea di smalti ha fatto proprio centro. Cosa ne pensate di Astra Expert Gel Effect n. 34 Peach*? L'avete già visto nei negozi? E avete già provato qualche smalto Astra di questa linea? Fatemi sapere! Vi lascio i link agli altri due smalti usciti con la stessa mini-collezione in caso ve li foste persi, e anche quelli ad Astra sui social! Isn’t it gorgeous for Spring and Summer? I also don’t think I own something quite like it. What I have is either more coral or more orange, nothing mixed this good. I really love it, and if you happen to travel to Italy be sure to pick it up, it only costs 3€ or 4€ depending on shops, and it’s totally worth it! The whole Expert Gel Effect line from Astra is amazing to be honest, they really nailed it. 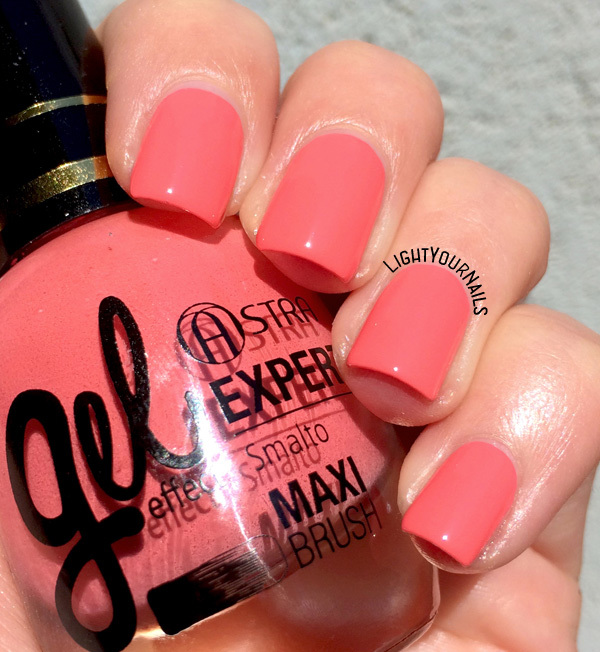 What do you think of Astra Expert Gel Effect n. 34 Peach*? Do you own anything quite like it? They usually look bad on me, too, but this one is actually very flattering! I am not surprised that you've got a lot of compliments for this one. It's simply wonderful! I really do like this color on you, and I agree it's perfect for summer! Thank you! It feels so good to finally find a Peach that works with my skin tone! That's it, I'm going to Italy! Lovely color; this is one of my favorites for summer. Great swatches! Incrocio le dita! Qua da me questa linea si trova facilmente, sono gli altri che ancora non ho mai visto! This is delightfully squishy looking! Thank you! It looks squishy in real life, too! I am jealous of how good you look in corals. This is something new to me because I've never looked good in corals! Maybe my skin tone is weirdly changing colour. That makes so much sense to me, too! Thank you Ann! It's quite an old Italian brand!